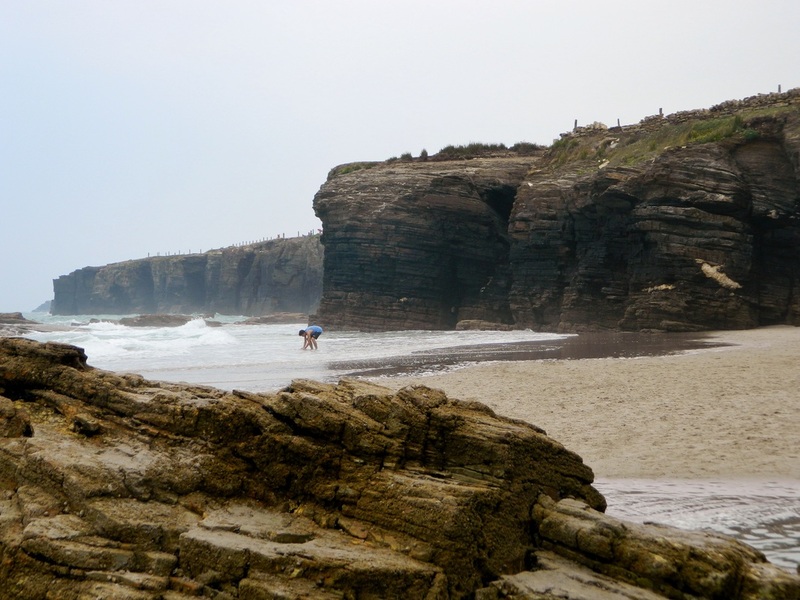 Porto, Portugal is so close to the Galicia region of Spain that if you're going to see Porto, you might as well hop on over the border to Galicia, or vice versa...so I have categorized both areas together here in one trip... We drove this 1500 mile trip from southern Spain in 5 days--one long driving day all the way to Porto, 3 shorter driving/sightseeing days, and one long driving day home. It's an aggressive itinerary so if you don't love a good road trip, you might be inclined to fly. Be warned though...at 30,000 feet you will miss out on some spectacular scenery. 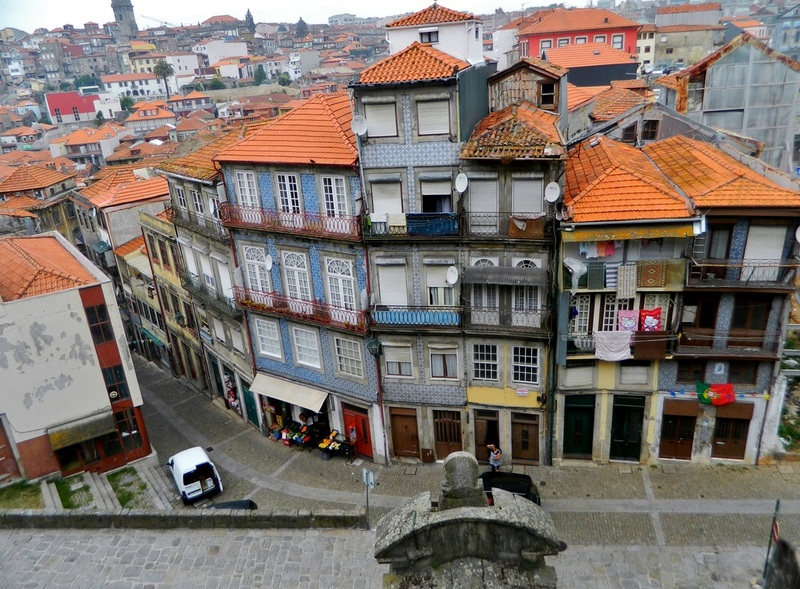 Rick Steves, my travel guru, describes Porto as having a "gritty, warts-and-all character," and he is right on. The city is full of old-world charm, with heavy emphasis on the "old." 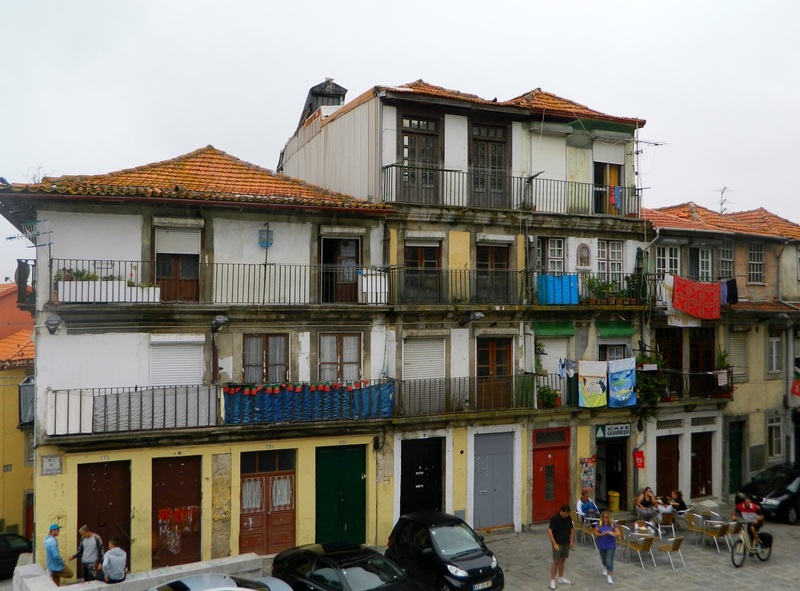 Where other cities have worked hard on restoration and beautification, in Porto you get the sense that you are seeing things as they truly have been for hundreds of years. That said, it has a beauty all its own. 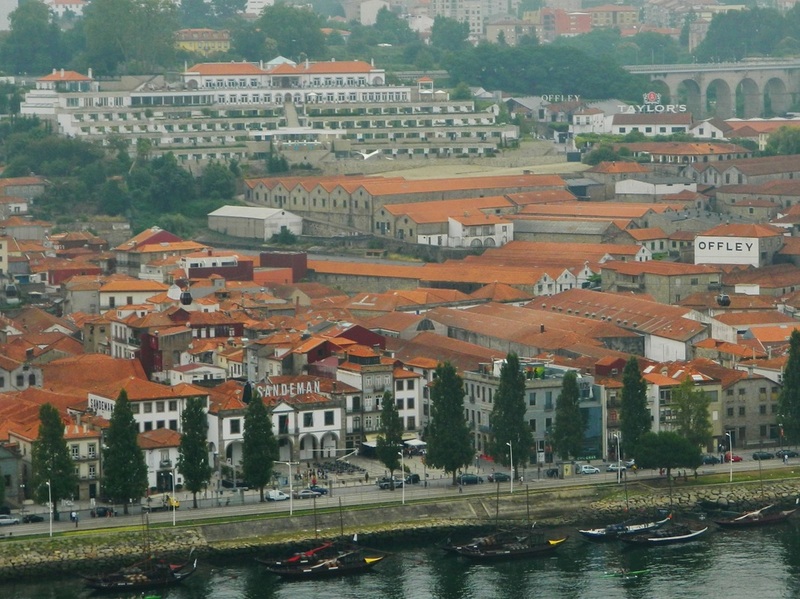 Porto sits at the mouth of the Douro River, one of the largest rivers on the Iberian Peninsula. 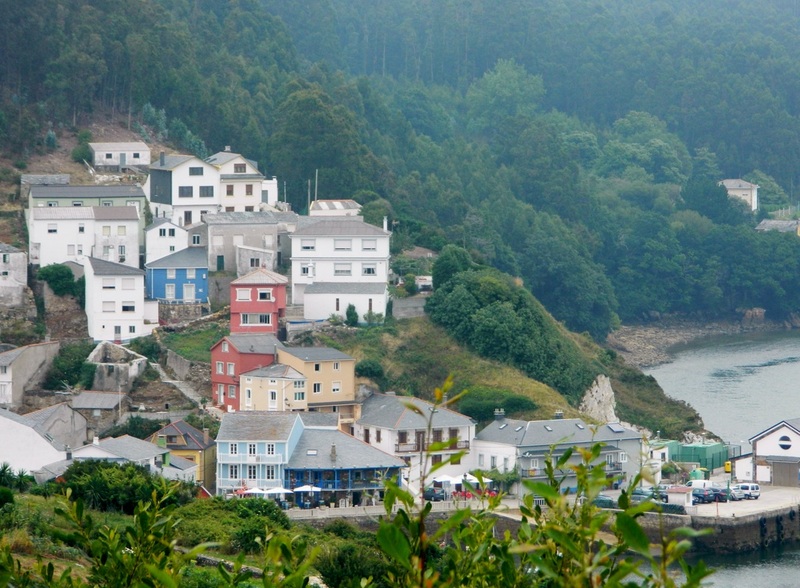 The red-roofed buildings, blue-tiled facades, and ivy covered hillsides are very picturesque! 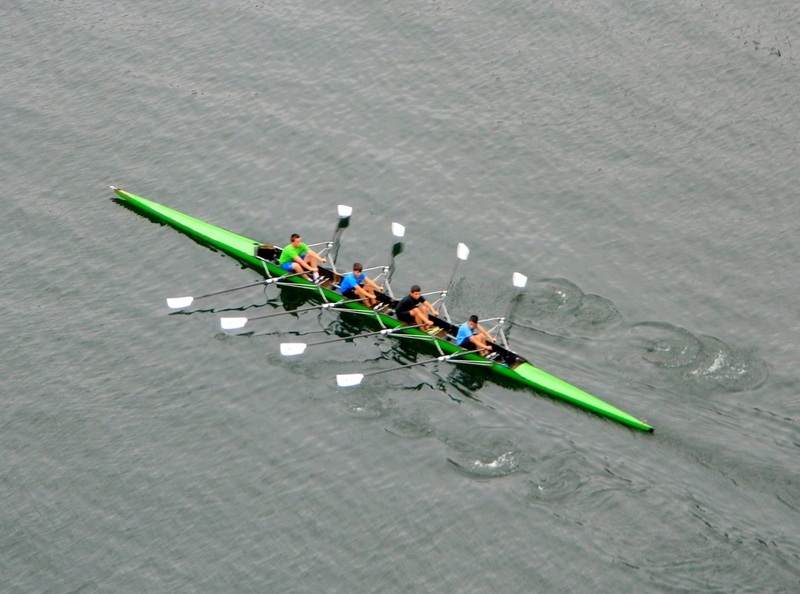 The riverfront area is teeming with activity--rowers, river cruises, and barges on the water, and many beautiful port wineries to explore. 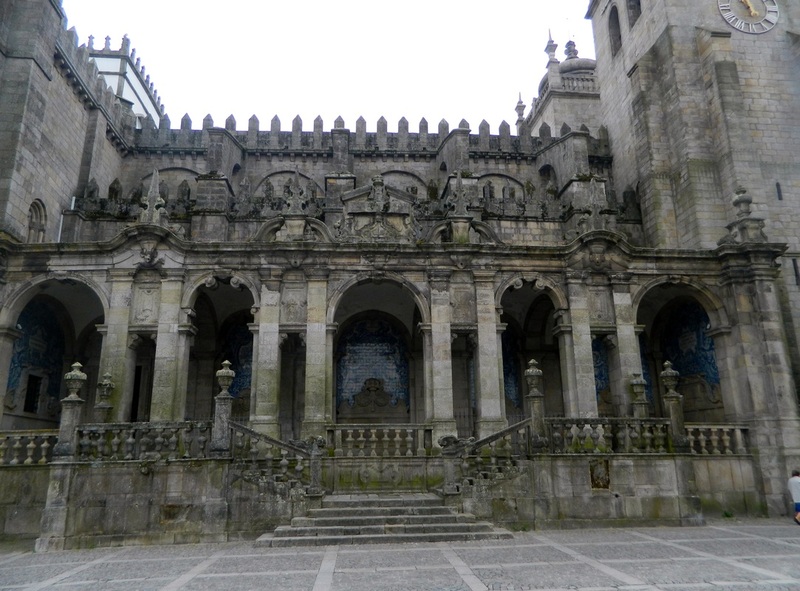 This church is the Igreja de Santo Ildefonso in Batalha Square. It was right outside of our hotel. The facade of blue tilework was common during the era it was constructed in the early 1700's. This beautiful blue "azulejo" tile fronts many of Porto's buildings. Several bridges span the Douro. 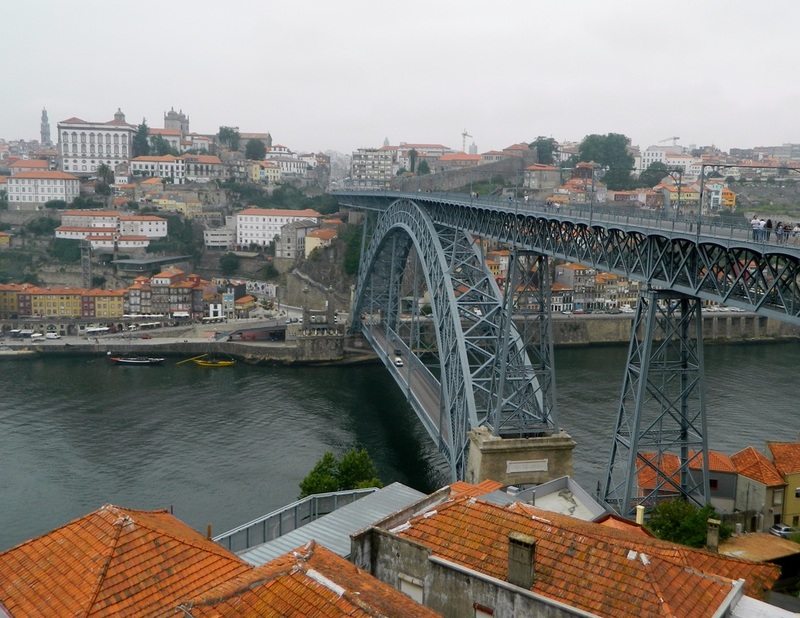 The bridge pictured below is the Luis I, which connects the cities of Porto and Vila Nova de Gaia, the city where the wineries so famous for making Port wine are located. On the upper level, this is a pedestrian walkway and train bridge where the Metro de Porto cuts across the river, and the lower level is open to pedestrians and cars. This bridge opened in 1886 and at the time was the longest of its kind in the world. 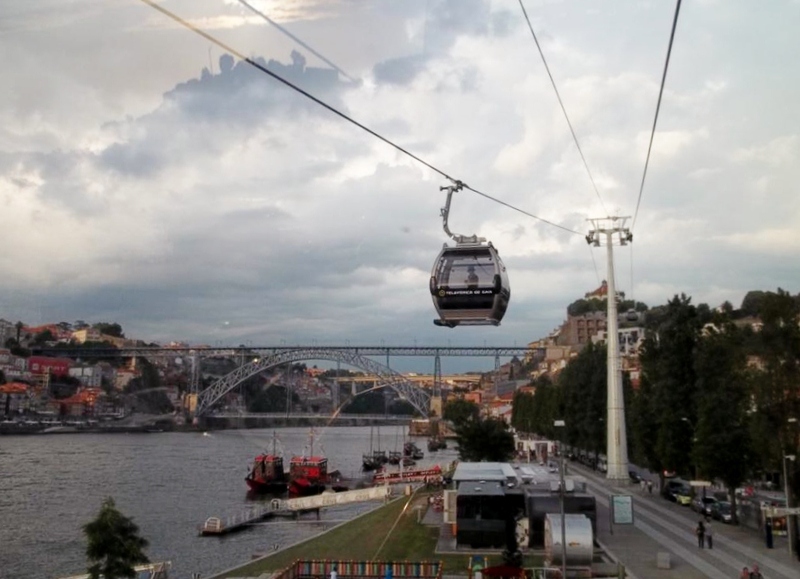 The gondola is called the Teleferico de Gaia. Once you walk across the bridge to the Vila Nova de Gaia side, you can pay for a gondola ride which transports you to the bottom of the hill to the wineries and gives amazing views of the city. 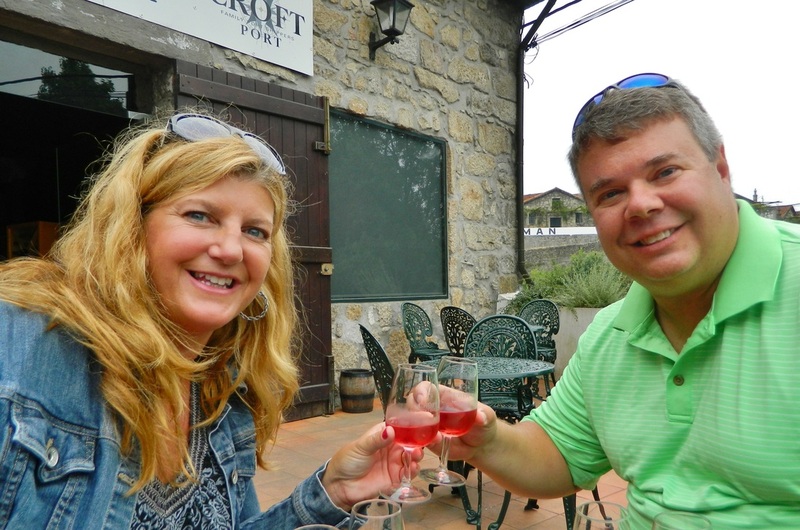 We bought round-trip tickets which included a free Port tasting at Porto Quevedo, one of the wine cellars in the area. If you cross back to Porto on the lower level of the bridge, there's a funicular train to take you to the top! Two kids in a barrel...the barrels are HUGE! 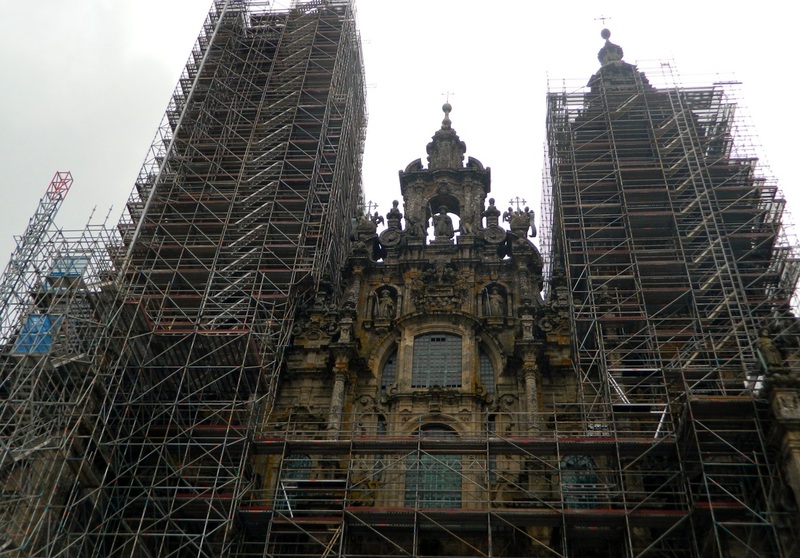 Santiago de Compostela is the capital of the autonomous region of Galicia in northern Spain. The Cathedral de Santiago was built on the site where it is believed the remains of the apostle, James, are buried. Legend has it that in the year 813, a shepherd was guided by a bright star to the spot where he discovered some remains in a tomb. He immediately reported his findings to the bishop who declared that the remains were of the apostle, James. Not quite sure how he figured this out in the days before DNA, but apparently there were some miracles at work. The bishop then reported the news to King Alfonso II. This legend, which included many miraculous events, enabled the Catholics to increase their stronghold in northern Spain during the Christian crusades against the Moors, but also led to the growth and development of the city. To honor St. James, a Cathedral was built at the spot where he is buried, and every year since the discovery of his remains, people have made pilgrimage to the site. The earliest records of pilgrimage to the shrine date from the 9th century but by the early 1100's, the pilgrimage had become a highly organized event. 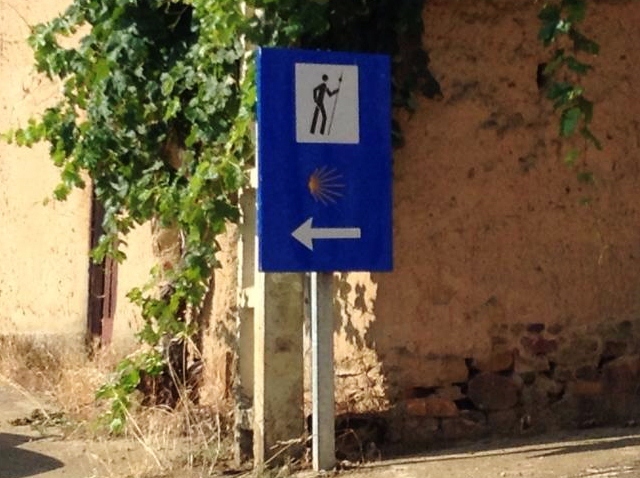 El Camino de Santiago (The Way of St. James) is the name of any of the pilgrimage routes that lead to the cathedral and its shrine to St. James. 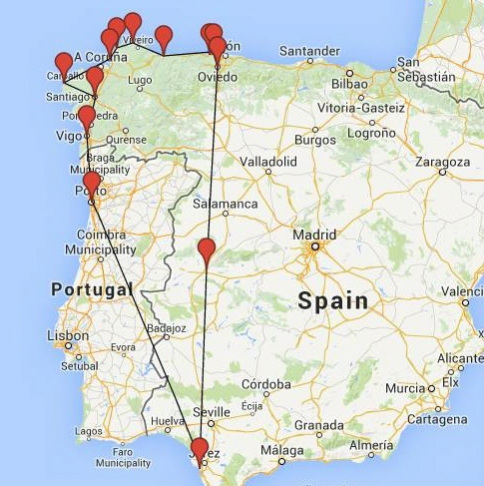 "The Way" can take dozens of routes to Santiago, but the most common begins in France near the border with Spain, and covers about 800 kilometers through part of the Pyrenees mountains and all across northern Spain. 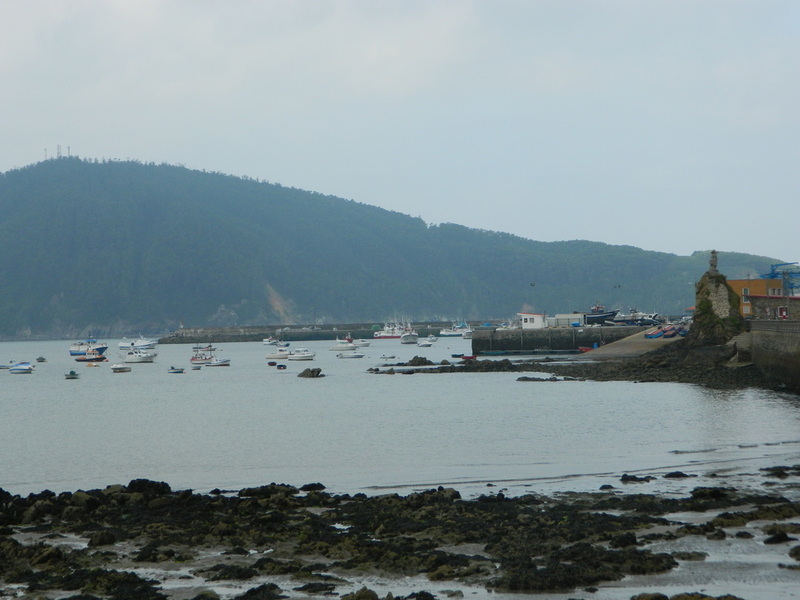 The route is marked with the symbol of the Galician scallop shell. The scallop shell acts as a metaphor, a bowl, and a souvenir--the grooves in the shell, which meet at a single point, represent the various routes pilgrims traveled, eventually arriving at a single destination--the tomb of James in Santiago de Compostela. The shell is usually worn by the pilgrims as an outward sign denoting that they are travelers on the Camino de Santiago. Most pilgrims receive a shell at the beginning of their journey and either wear it around their neck or attach it to their backpacks. In the days before water bottles and energy gels, the scallop shell also served practical purposes for pilgrims on the Camino de Santiago. The shell was the right size for gathering water to drink or for eating out of as a makeshift bowl. In addition to the people who do the walk as a religious pilgrimage, the majority are hikers who walk the route for non-religious reasons: travel, sport, or simply the challenge of weeks of walking in a foreign land. Also, many consider the experience a spiritual adventure to remove themselves from the bustle of modern life. It serves as a retreat for many modern "pilgrims". Nowadays to receive official certification of having made the pilgrimage, pilgrims must walk a minimum of 100k or bike 200k. Upon completion, certificates can be collected at the Pilgrim's office in Santiago. 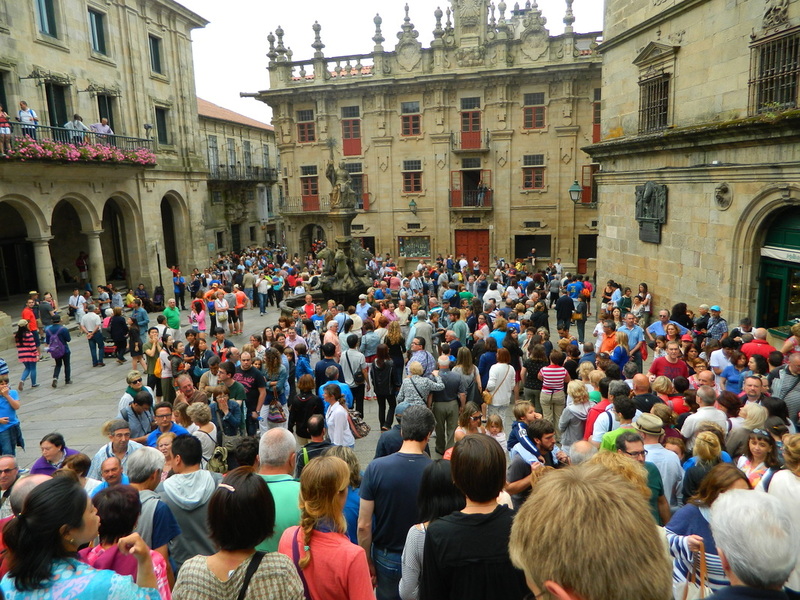 Most travelers carry a Camino passport called the "credencial" and have it stamped at various points along the way to prove they covered enough ground to qualify for certification. Certificates will not be given out without a stamped credencial. The certificate is called the Compostela. Every year on the 25th of July, Santiago celebrates the Feast of St. James--the biggest celebration of the year in Santiago. 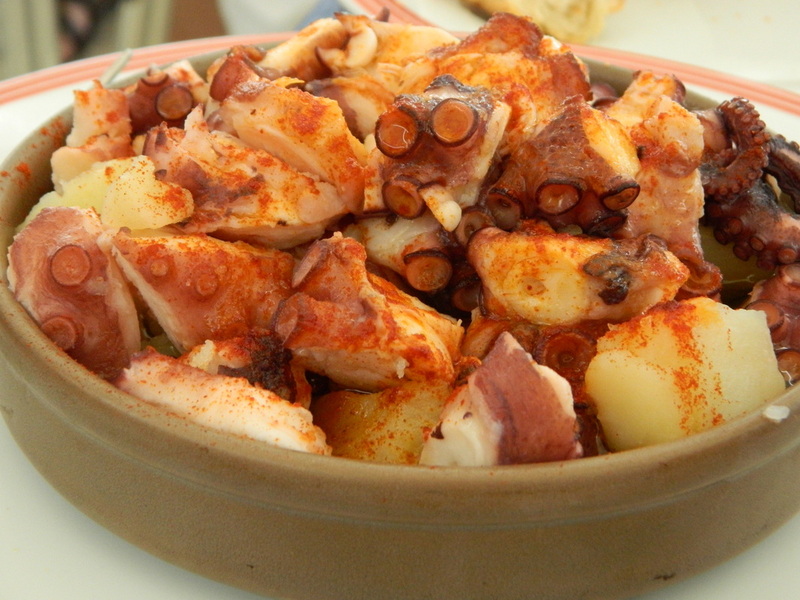 This is a holiday all across Galicia. As luck would have it, we arrived on the 24th to experience fireworks at midnight, and the full regalia of the celebration the next day. We attended the Pilgrim's Mass and had the amazing opportunity to experience the excitement as thousands of pilgrims converged on the site for the celebration. Security was high, as the King of Spain was in attendance for the celebration. 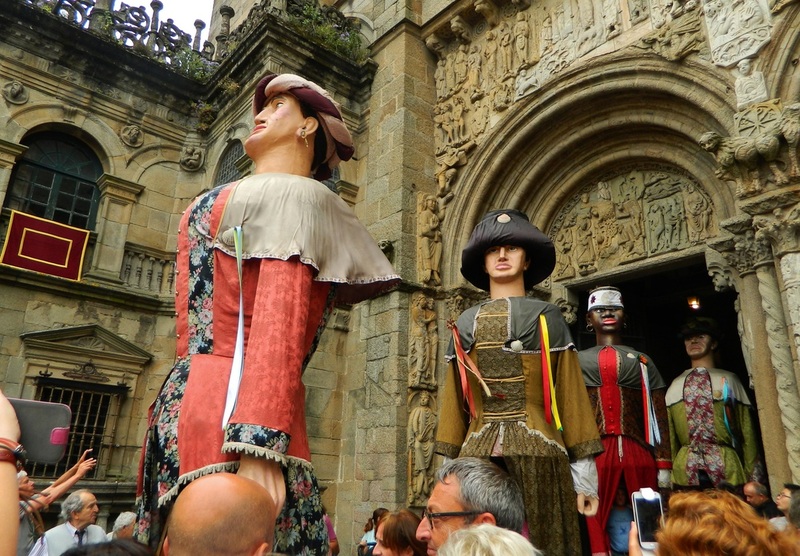 Giant-headed figures are paraded through the cathedral and through the streets in celebration. 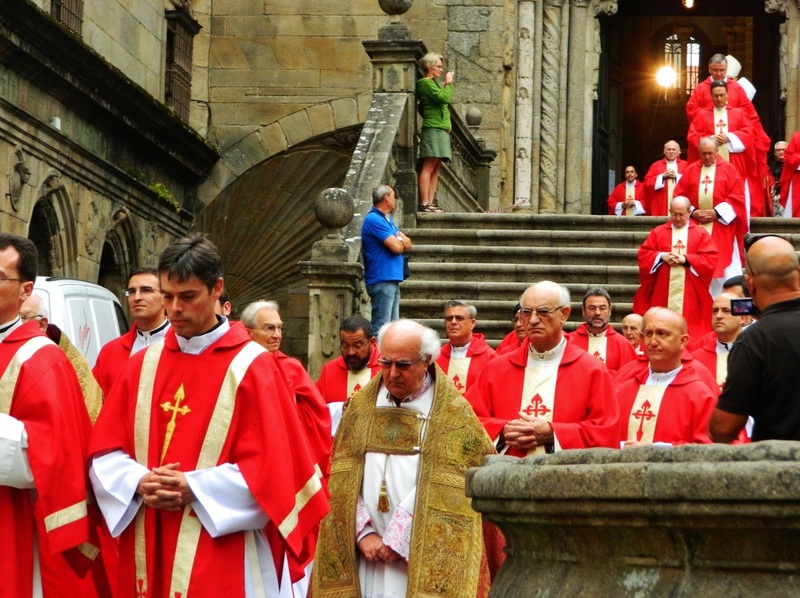 Though pilgrim's masses are held each day, on the Feast of Saint James, the greatest symbols of the Cathedral of Santiago are put into action. The botafumeiro in the video below is a huge censer (incense burner) that measures about 5 feet high, weighs almost 120 lbs, and requires eight people (tiraboleiros) who have been specially trained to swing it in the interior of the cathedral. The name botafumeiro comes from "botar" (expel) and "fume" (smoke). The censer is suspended 65 feet from the ceiling with a system of ropes and pulleys, and once in full swing, extends the entire length of the transept. At full speed, it zips by at over 40 miles an hour. Aside from the liturgical uses of incense inherent to the Catholic mass, it has traditionally played an important role here by covering the stink (for lack of a better word) of the the not-recently-bathed pilgrims who in the past might stay in the cathedral several days after completing their pilgrimage. I don't know if this is still allowed today or not but I would guess camping out in the cathedral is probably not allowed today. The botafumeiro is only used on major catholic holidays and the Feast of St. James due to the cost associated with the incense and manpower needed to swing it, although last year an agreement was reached to allow it to be used at the pilgrim's mass every Friday at 7:30PM as well. Additionally, groups can request in advance to see the botafumeiro in action when they visit, for the cost of 300 Euro. For more info, click the link to the Cathedral's site below. If things go as planned, one day we will walk the Camino ourselves and become peregrinos in our own right...I can't wait! From Santiago we continued out to the coast at Muxia...what an amazing place! 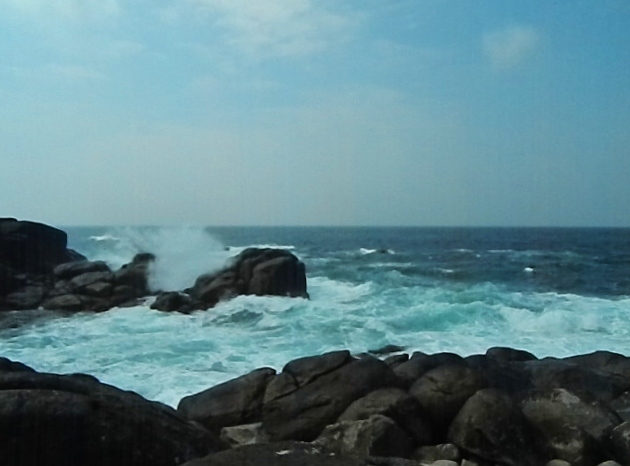 Ocean, rocks, a lighthouse, a small church and nothing else...so beautiful and peaceful, and for me, the star of this trip. Santiago was hard to beat, but the natural beauty here was simply stunning. 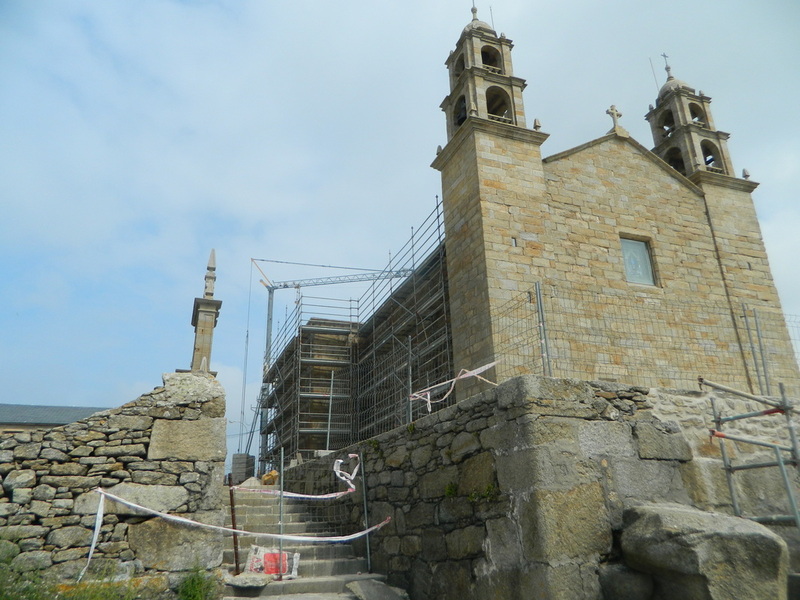 The Virxe da Barca church at Muxia, Spain was struck by lightening last year so is currently under construction. 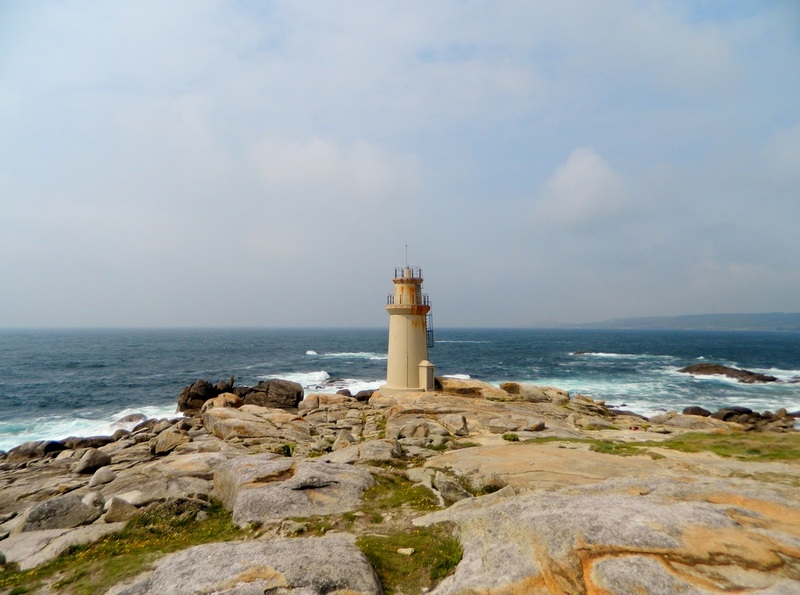 From Muxia, we continued north and west along the coast to the city of Ferrol, a way-point before hitting Cathedral Beach the next day. 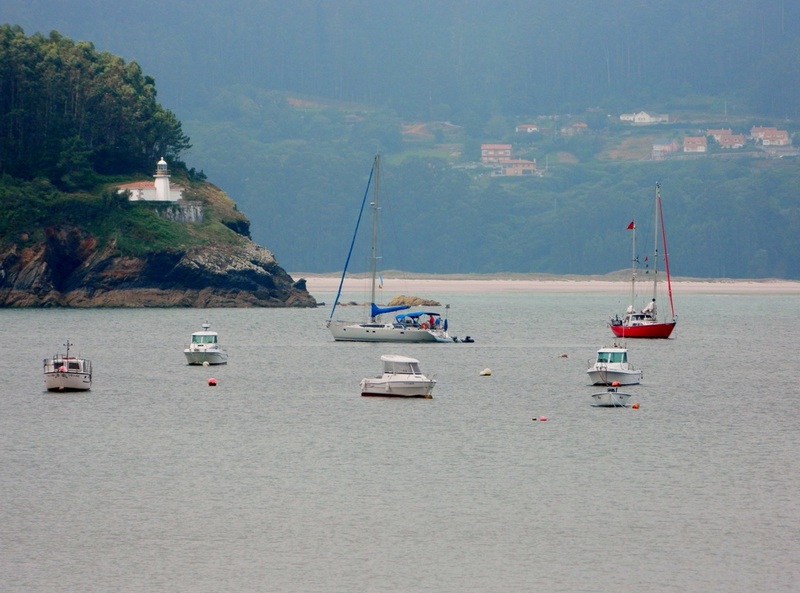 The coastal drive takes you through many small beach towns like the ones below. 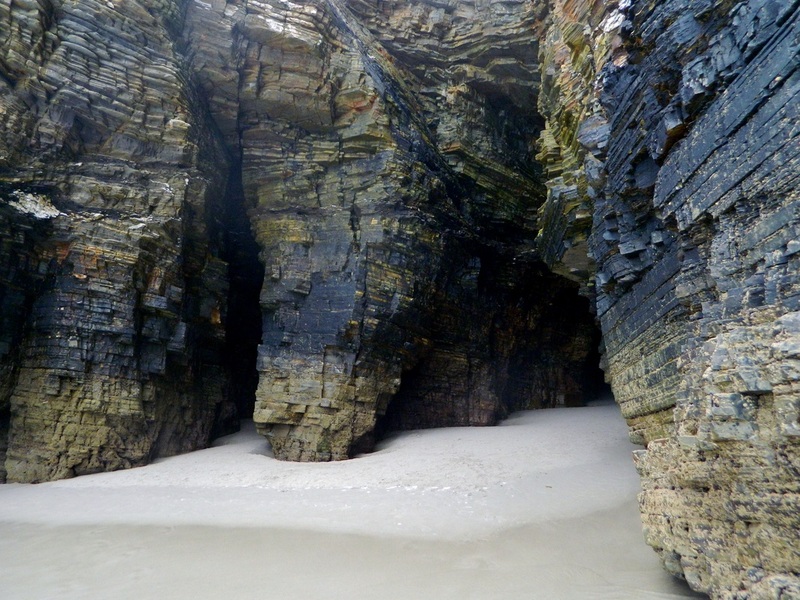 As Catedrais beach, translated as Beach of the Cathedrals, is named for it's massive rocks and cliffs that form natural arches and caves along the shore. 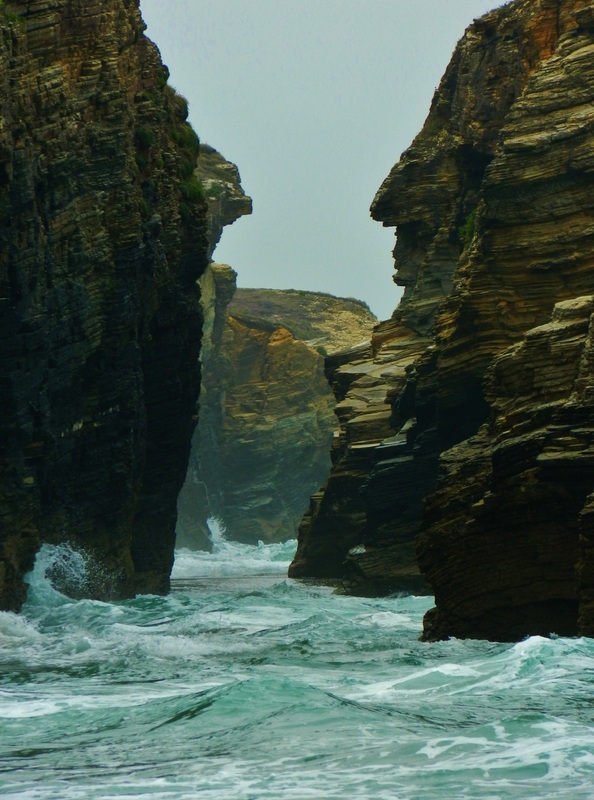 At low tide, the arches are fully visible from bottom to top, and you can appreciate their massive height. 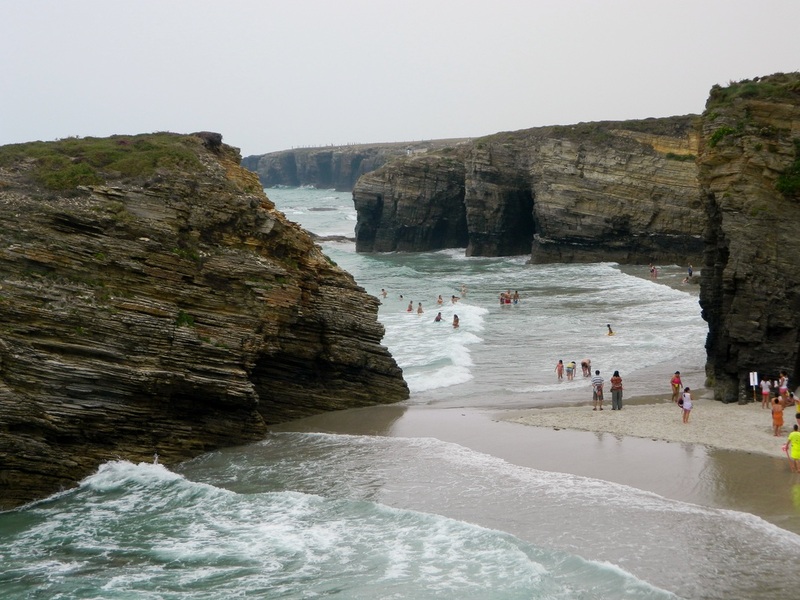 During low tide there is a decent swimming area, but as the tide comes in, which happens very rapidly, the swimming area shrinks significantly and beach-goers have to watch that they don't become trapped in an area with no escape route. 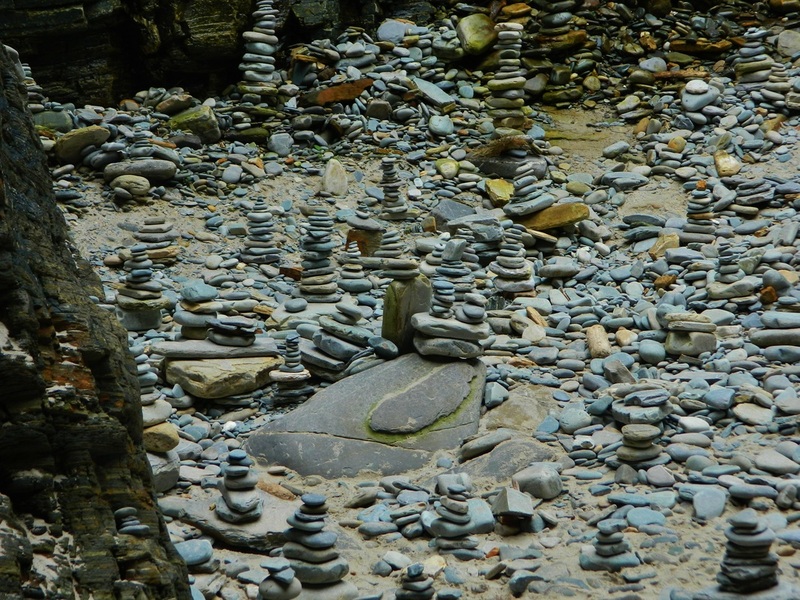 As the tide comes in, many rocks are hidden dangerously just below the surface. The beach is constantly monitored by land and by boat by lifeguards who watch the swimmers and the tide and cordon off unsafe areas as the water rises. What else can I say but ahhhhmazing? 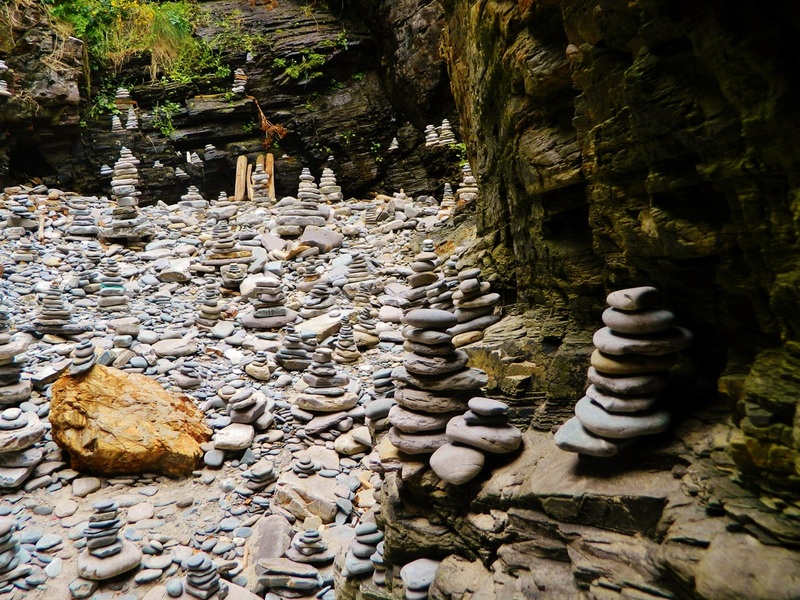 Many of the caves end with a surprise like this...sunlit, dead-end grottoes filled with flat rocks, perfect for stacking. 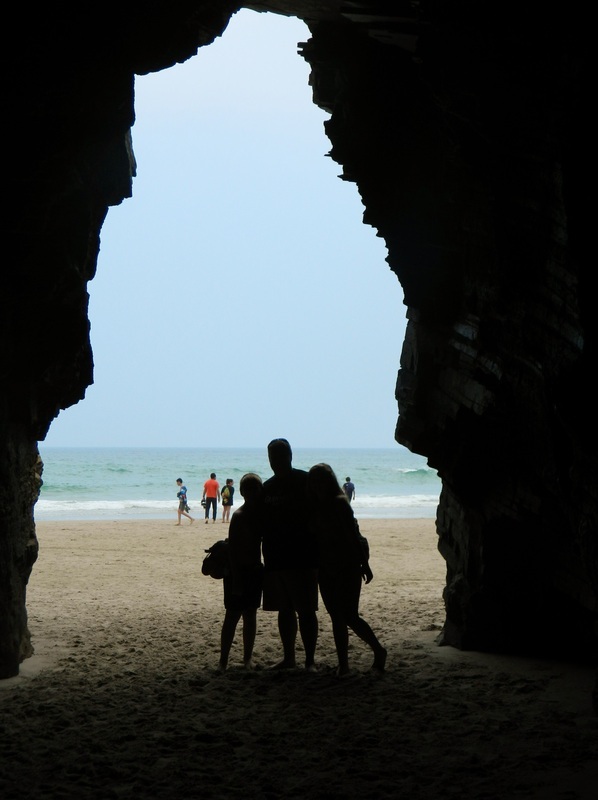 Just when you think you're out of the cave, you realize there's no way out but back the way you came in! There's a restaurant at Cathedral Beach, specializing in seafood...nice to sit outside and relax after playing in the water and checking out the caves. It wasn't that great, but it's the only place nearby, and it has a great view. 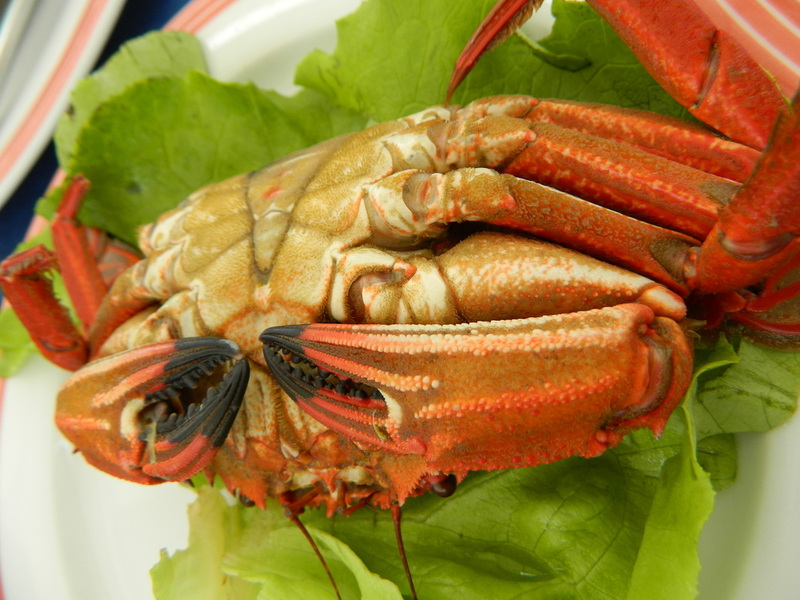 We had the pulpo (octopus) and crab, but only get the crab if you don't want anything to eat--they're only little bitty guys! After spending the night in nearby Naveces (which was a weird place that I wouldn't recommend...pretty, but weird), we headed for home. We got an early start and were driving through the mountains pictured below on a spectacular morning. 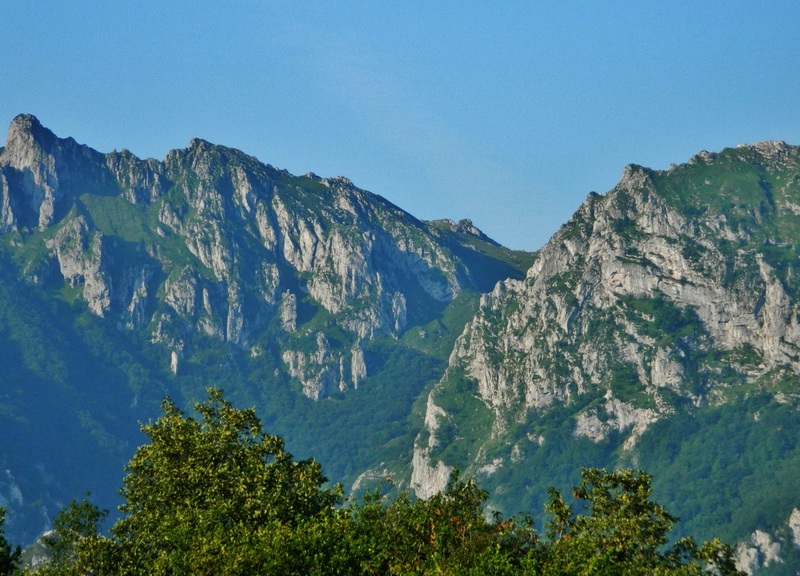 This is part of the Cantabrian Mountain range, which runs east to west across northern Spain. A beautiful (albeit LONG) drive. Happy travels, friends!